Whether you're building an office space, an apartment complex, or a home for yourself, never underestimate the role that concrete plays. Not only do buildings rely on concrete foundations to remain sturdy, but they need concrete roads, driveways, sidewalks, parking lots, and other structures to make them accessible. Renco Construction is proud to service clients in Flower Mound TX and works hard to create durable and long lasting structures for both home owners and businesses alike. As one of the areas most experience contractors, Renco also offers quick and effective concrete repairs. Operating throughout the Dallas Metroplex, we offer the service you need for a durable, and long lasting solution. Disability Access - If you own a business, you have both a legal obligation and a moral responsibility to make your premises accessible to employees and customers with disabilities. Concrete ramps are one of the most effective ways to do this, as they allow people who use wheelchairs or have other mobility restrictions to get into your building. Renco Construction builds safe, solid ramps with plenty of space for any number of people. Convenient Entry - As a business owner, you want employees, customers, and guests to be able to get into your building quickly and easily. By building parking lots and other access structures in convenient locations, we allow anyone who wants to enter your office to do so without trouble. We can also build private roads on your property. This is invaluable if your business is located in an area that has few direct connections to public highways. Outdoor Safety - Whether you own your home, an apartment building, or an office building with extensive outdoor facilities, anyone who lives in or visits your property should be able to use those facilities safely and conveniently. By building concrete sidewalks, we make it easy to navigate even the largest outdoor areas. The Renco team has the training and expertise to pave any area. No matter how remote your location is or how challenging the ground is to build on, we can create safe structures that will serve you well for the long haul. No matter how strong your concrete structures are, eventually they will begin to deteriorate. For this reason, Renco Construction offers residential and commercial concrete repair services throughout the Dallas area. 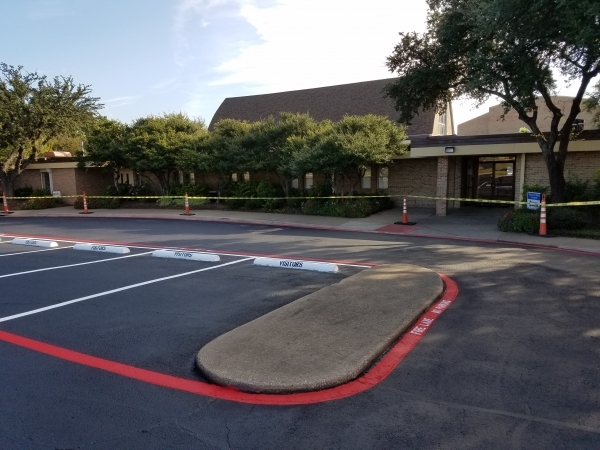 If you notice a problem with your sidewalks, parking lot, ramps, or roads, our team won't hesitate to give you a visit and evaluate what is causing your issue.. We recognize that seemingly minor problems are often signs of much more serious structural issues, so we will inspect the entire structure in depth. Once we have uncovered the full scope of the problem, we will make quick, comprehensive repairs to shore it up. We will also advise you on how best to protect your structures from future damages. Regardless of the size of your job, Renco is equipped with the manpower and expertise to get your job done on-time and on-budget! We are fully bonded and carry full worker's comp insurance on all our employees. For more information on concrete construction and repairs in the Metroplex, contact Renco Construction today.